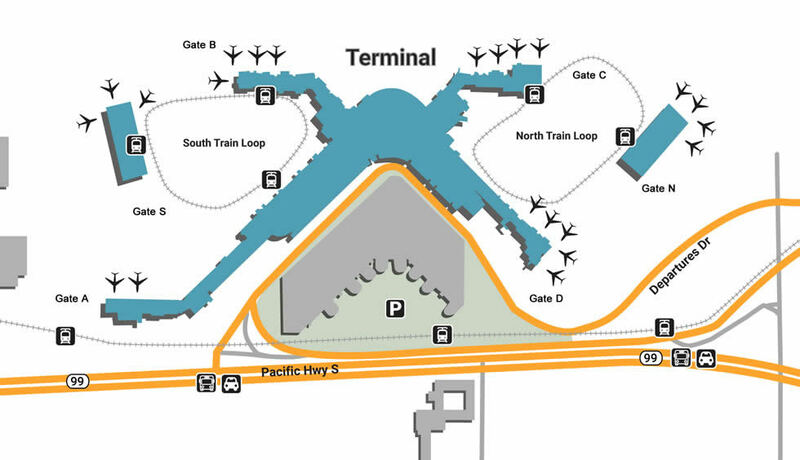 Getting around the Seattle-Tacoma Sea-Tac International Airport can be confusing at times so having a map can help get you to your destination better. Surrounded by water, Seattle is home to evergreen forests that sit at the foot of mountains as beautiful as the city’s skyline. Seattle-Tacoma International offers sweeping views from grandiose windows, making relaxation more than easy - make things easier by enjoying the countless services, restaurants, and retail shops that are sure to keep your mind & body alert for an adventure. SEA Airport makes everything easy, especially when it comes to parking. The closest parking lot to the airport is the massive 8-floor garage, each floor serving different purposes. General Parking is located on floors 1-3 & 5-8, allowing guests hourly, daily, and weekly rates. For those looking for monthly parking, become a member for fast access through Terminal Direct, an area that offers immediate sky bridge access. Terminal Direct is also available for short-term parking, but at a higher cost. Home to a booming tech industry and endless free thinkers, Seattle is a Mecca of unique ideas. This shows in the airport’s services, which range from self-guided art walks to live music acts. There are two outdoor locations for smoking, one at the North end of the Lower Drive by door 26 and another at the South end on Baggage Claim level. The facility is also accommodating to business travelers, offering conference centers and exclusive airport lounges like the Club at SEA. Make your layover count by taking the time to shop at all the interesting stores, kiosks and boutiques that make Seattle Airport worth enjoying. If you happen to be in Gate A and love votive candles, check out the hand blown glass pieces at glassybaby. If you’re looking for some unique fashion, visit Show Pony’s (Gate C) unique selection of jewelry, handbags, and graphic tees. Those in need of a neck pillow or snack should head to Plane Wear for must-have travel accessories. Indulge in the airport’s wide array of eateries, which include local joints alongside familiar eats. Get a pre-security pick-me-up at Starbucks, also located at Gates A, B, C, N, as well as Central Terminal. Try some unique Japanese cuisine fused with modern Asian at the self-serve Waji’s, located at Gate C and offering free Wi-Fi. As a seaport city, Seattle has some of the freshest seafood in the world, which is exactly what makes the upscale marine eatery Dungeness Bay (Gate S) so special.